Haiku by myself. Photo by my youngest brother. My brother, Tommo, works for Sharp Electric Co. He and his family recently moved to Dubai, where the climate is apparently different from Japan. Tommo's little boy is looking at something, but he did not tell. So, I just let my imagination work, and wrote the haiku. 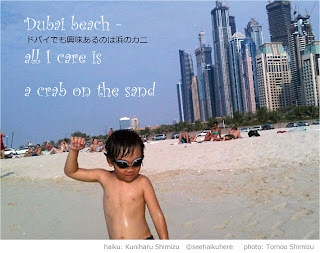 Dad is working at one of those high-rise, and the boy is at beach playing with crab. smart boy...just that crab is not a good thing to play with!